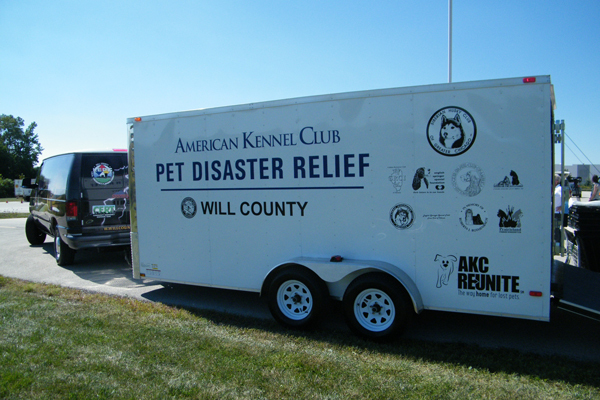 Will County is now equipped with a state-of-the-art AKC Pet Disaster Relief trailer that will be available to respond to a disaster scene that needs assistance sheltering pets. 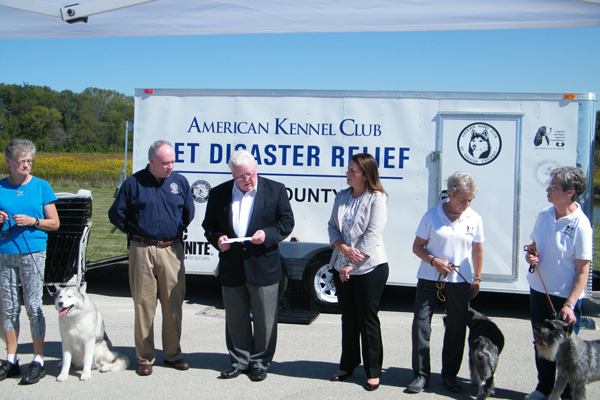 AKC Pet Disaster Relief, a national program that is dedicated to keeping pets and their owners safe in the aftermath of natural or civil disasters, joined forces with local American Kennel Club dog clubs and dog lovers to present an emergency trailer to officials from Will County. The purchase of the trailer was made possible by more than $22,000 in donations and grants from the Siberian Husky Club of Greater Chicago, the English Springer Spaniel Field Trial Club of Illinois, the Golden Retriever Club of Illinois, the Prairieland Standard Schnauzer Club of Central Illinois, the English Springer Spaniel Foundation, the English Cocker Spaniel Club of America, the Alaskan Malamute Club of America, the Standard Schnauzer Club of America, Kate Weems, the Kishwaukee Kennel Club, and AKC Reunite, the nation’s largest non-profit pet identification and recovery service. 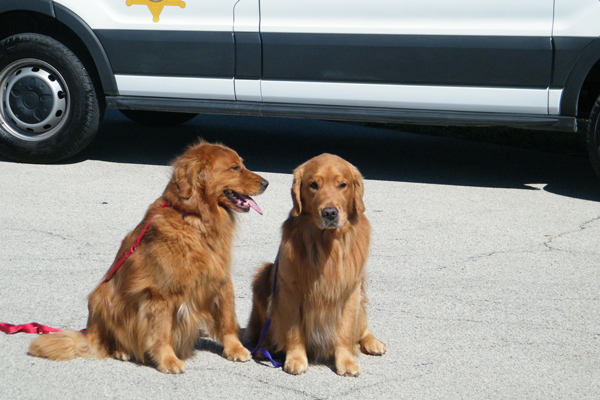 “On behalf of Will County citizens and pets, we wish to thank the generosity of AKC Reunite and the AKC Dog Clubs who contributed so generously to make the donation of the Pet Disaster trailer possible,” commented Will County Executive Larry Walsh. “The Siberian Husky Club of Greater Chicago and all the other supporting clubs are dedicated to giving back to our community and helping our fellow citizens and their pets. 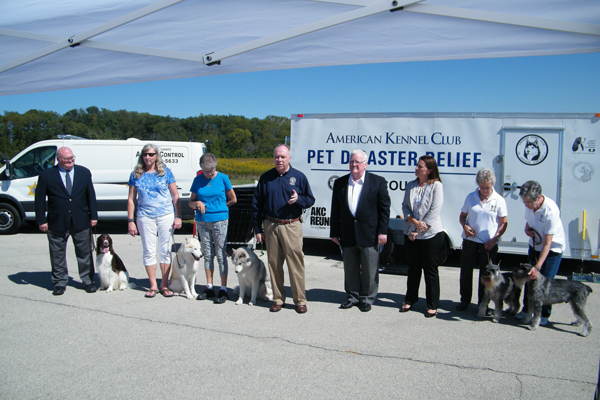 We’re very proud to help bring this AKC Pet Disaster Relief Trailer, which can provide meaningful support during the difficult times before and after a disaster,” said Carol Preble, President of the Siberian Husky Club of Greater Chicago. “American Kennel Club dog clubs are dedicated to keeping the pets in our community happy and healthy. We recognized AKC Pet Disaster Relief as a new way to accomplish this goal, and our members jumped at the chance to bring this important new resource to the area,” said David Hopkins, AKC Delegate from the English Springer Spaniel Field Trial Club of Illinois.